Is there the term "funkynised" Already ? That is what has happened with the new Squier Vintage Modified Jazz Bass. Stylish 70s optics, a maple body and Duncan designed pickups produce exactly the sound that is suspected with this look. As well as a few upbeat finishes, some of the instruments of the Vintage Modified series have Duncan Designed ™ Alnico 5 pickups. 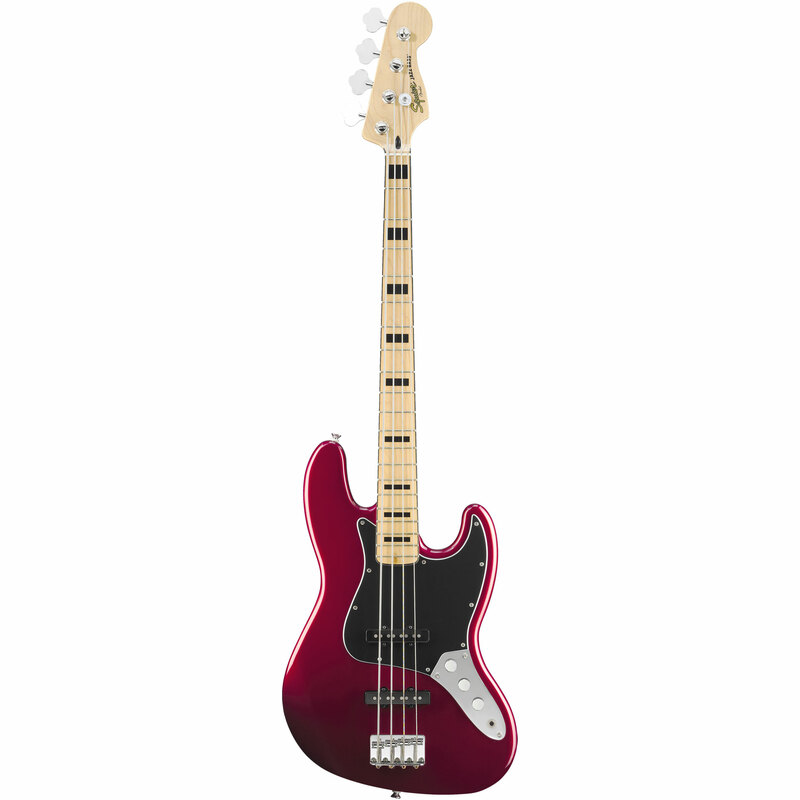 I purchased the Squier Vintage Modified 70's Jazz Bass from Music Productiv a couple of weeks ago, and held back on my review to give a fair reflection of my overall experience both as an MP customer, and as a bassist. First, my customer experience. I ordered the bass on a Sunday night, and it arrived on my door in Ireland via UPS on the following Thursday morning. That's pretty impressive based on my experience of delivery times from other vendors (even in the UK) to this little island outpost of Europe. The instrument was exceptionally well packed, with a spare Ibanez cardboard box included in the pack to ensure that my new bass was secure (it crossed my mind that I might have got a freebie extra guitar, but sadly, that wasn't the case...). All through the shipping process I got updates advising of progress through the supply chain, which only helped to build my anticipation of the guitar's delivery. Great job MP for ensuring my purchase arrived quickly and in great shape - couldn't ask for more. As a musician, the bass itself is a joy. From the moment I deboxed it, it was clear this is an exceptional instrument. The build and finish are second-to-none - you can't beat that Candy Apple Red! The instrument was pretty much playable once I took off the protective plastic. Great action with no buzz, intonation just needed a slight tweak on the E- and G strings, pots roll cleanly and without any of the noise you could expect from a budget instrument. The neck and fretboard play really fast and smoothly - not a hint of 'fret sprout' anywhere. The sound of the instrument is everything you expect from a JB: punchy lows, snappy middles, a bit of growl, and the upper register is just gorgeous. As someone who plays a lot of melodic stuff above the 10th fret on the A, D, & G strings, this just really suits my style. The upper tone and clarity also makes funk / slap lines a delight to play and listen to. This is my first JB (I've mainly been a P-bass and Stingray man til now) and I was concerned about single-coil 50Hz hum. This proved to be unfounded - the signal to noise ratio is so high (i.e. high signal & low / no noise), I actually thought the electronics were shielded. However, it's just really well made, and the Fender designed pickups are great. When researching this instrument I'd also read that sharp pick-up cover edges could be an issue: as an inveterate "thumb-rester" I can report that it feels as comfortable as resting my thumb on my well-worn '88 Fender Precision pick-up covers. To summarise, I'd take the Pepsi challenge between my new Squier JB and a Fender MIA Pro JB and expect the result to be a pretty close run thing, sound-wise and regarding look and feel. This model has been around for about 5 years now, and I have a feeling the line will be retired soon (just a guess on my part), and I know luck and quality control plays is a bigger variable with budget instruments than more expensive guitars, but if you're into getting a Fender quality instrument at Squier prices, simply get one of these. In conclusion, great service Musik Productiv (and at a lower price than some other well-known online retailers), and thanks Squier for building this exceptional bass. Features is great, real 70´s funky look. Sound is also good, surprisingly good mics! not fitting perfectly with the other side of the control panel. But anyhow if that is not bothering you, go for it! It still has a fairly good value for money. And looks is the most important thing, isn´´t it! This item was given an average rating of 4.8 out of 5 stars. In total, 2 reviews were submitted. The comments are not the opinion of Musik Produktiv, they are the subjective opinions of our customers. 36 ratings exist without a text or these reviews are written in another language.